Looking for some fun summer kids activities to stop the “I’m bored” whining fest? For the month of July I thought it would be fun to put out some Kids Summer Boredom Buster ideas. I compiled a list of super easy, fun summer activities to help make your days fun and whine free! So let’s get started! I know this stuff has been around forever, but I’ve actually never made it! And with the amount my kids go through I thought it was worth it to try making our own. Really it’s mostly flour and water, so the cost is very minimal as well. Especially if you have four kiddos who love play-doh! In large bowl mix flour, salt, and cream of tartar until well mixed. In a separate bowl mix water and oil. Separate water mixture into 6 separate bowls and add different food coloring to each bowl, enough drops to make it VERY bright. Add 1 of the colored water cups to each bowl of flour one at a time. Mix until it reaches the consistency of bread dough. Repeat for remaining colors. Store in an airtight container, i.e. plastic Ziploc bag. Last step is to hand it over to the kiddos for some creative playtime! 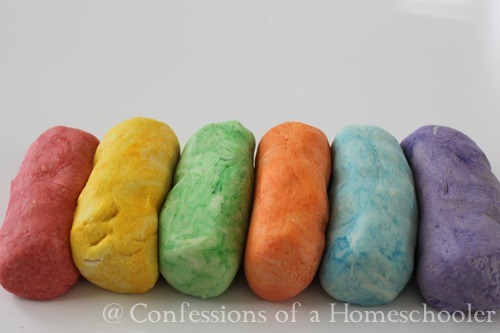 Simple as that, you have homemade play-doh for a fraction of the price! Enjoy! The ingredients say flour but in #1 it says cornstarch – can you clarify? I live in a country where cream of tartar is not available. Do you know of something else I could use to help keep play-dough longer? I was wondering about the ingredients as well. Where does cornstarch come in? How do u equally separate it? Guesstimate? In Directions Step 1, does it mean the cream of tartar, instead of cornstarch? Step 1 and step 2 both have salt listed but I only see it once in the ingredient list! I found the same recipe on Cook.com The cornstarch should be cream of tarter, and the salt in step two should be food coloring of choice. Have you every tired unsweetened koolaid to color play dough with? The colors turn out nice and bright, and it gives the play dough a nice fruity scent. Oh my goodness, does this ever bring back home schooling memories! The crafts, the recipes, field trips and so much more. I’m a grandmother now and have the pleasure of having my two granddaughters for the summer months and am now trying to remember some of the things I did with my own children to keep them busy and occupied and to teach them a few things as well. That is why I have visited your site. I needed to give my brain a jump start. I have enjoyed looking through your resources. I have written two children s books that were just published this year which I think would be great tools for your collection of resources. “Apples of Love” which is a story of a Grandfather and Granddaughters relationship with the message of the importance of sharing God’s blessings with others. The 2nd one “When I First Met Jesus” is story of the same little girl and how Jesus came into her life and not only changed her life, but her whole families life, just because another classmate cared enough to share. I hope you will check them out. Again thank you for this wonderful site. I have gotten a lot of good ideas. May God Bless you, your family and your endeavors. Loooovvveeeee this. 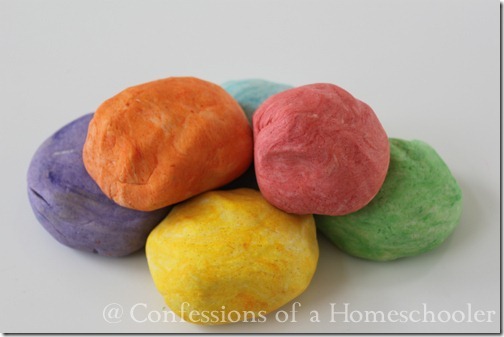 I love homemade play dough but not cooking it! This is fantastic. You can also add koolaid for a sent and color. This is not the right porportions. I had to add more water & even then it was so dry my hands feel like sand paper like I soaked all day in salt. I’m sure there are other ones online. I just wanted to let you know so that yoy could change it to make it better or Delete this PIN. Why is there so much salt in the play dough?